The government announced yesterday that maintenance grants are being scrapped for students starting university in 2016, to be replaced with loans that must be repaid. But there's still time to apply for a maintenance grant for September 2015 start. These grants help students from low-income families pay for their living costs at university—and none of it has to be paid back. 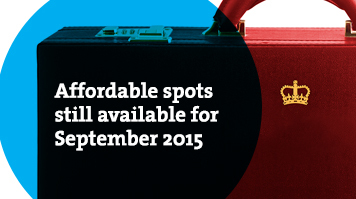 Starting a course this September means you might be eligible for this extra financial help. LSBU provides information on fees, funding and other assistance you might be entitled to. "If you were thinking of taking a gap year or have applied for September 2016 and don't want to miss out on a maintenance grant, you now might be considering starting in 2015 instead," explains Lynn Grimes, LSBU's director of student recruitment. "The grants will now become loans and will need to be paid back, like tuition fees. Fortunately, it's not too late to apply for 2015 start—applying to university is much more flexible than it used to be. "Our admissions tutors can be contacted at lsbuadmissions@lsbu.ac.uk or you can call us on 0800 923 88 88. Even if you think you've missed a deadline, give us a call or e-mail and we'll be happy to discuss your options." Search for a course now, and read more about how to apply for September 2015.